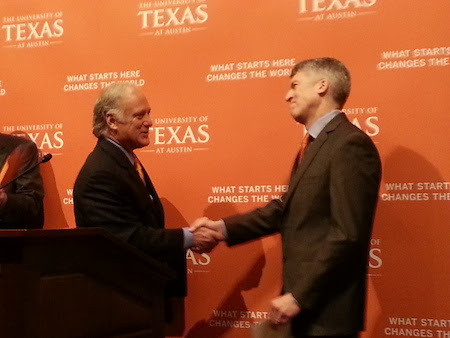 Today, I had the considerable honor of introducing the new dean of the Dell Medical School at UT-Austin. His name is Dr. Clay Johnston. This is a huge moment for this medical school that we’ve worked so hard to create, and I’ll have more on that in a minute. But first, some stuff about Dr. Johnston:He’s 49. He earned his bachelor’s in physics at Amherst College, his medical degree at Harvard University, and his Ph.D. in epidemiology at Berkeley. For 17 years, he’s been on the faculty of the University of California at San Francisco, and he’s served as director of stroke services as well as professor of neurology and epidemiology. He also directs UCSF’s Clinical and Translational Science Institute, helping accelerate research to improve healthcare and securing partnerships with biotech companies, foundations and private funders. This is a great hire. Dr. Johnston will be a visionary leader for this vital project. But it’s more than that.After Travis County’s passage of Proposition 1 in 2012 – which was essential to funding the medical school – the next big test for this effort was the hiring of an accomplished leader and dean. Well, we aced that test. The hope and promise for this project are being fulfilled. This medical school was born out of our community’s hope.We hoped to create a wellspring of doctors to keep our friends, neighbors and neighborhoods healthier. And we hoped for a hothouse of healthcare innovation – one built from the ground up, amid UT’s vast academic strengths and research resources, to transform our economy and our health. We took that hope and made a leap of faith by voting to help fund the med school with our taxes. I say all the time that hope matters. Dr. Johnston gets that. He’s going to help us land our leap of faith. We’ve invested a lot of money and emotion in this project; he’s the one who’s going to realize that investment. If you talk with Dr. Johnston for five minutes, you can hear his excitement. He envisions a top-flight medical school, built in partnership with this community around the demands of 21st Century healthcare. The process he’ll lead will bring Central Texas a new institution free of the biases and baggage that’s made it so hard for so many to adapt to this landscape. He also understands why we have this opportunity. He appreciates, deeply, the community’s optimism about the future, its commitment to this medical school, and the specific investment by the people of Travis County that make it possible.He understands the responsibility to partner with entities like Central Health and providers like Seton, and to do his part to help fulfill the 10 Goals in 10 Years that I set out in 2011 and that Travis County embraced in 2012 by passing Proposition 1. But more than that, he sees the opportunity in doing those things. He knows what we hope to achieve. He’s creating a plan for achieving it. And he has the commitment, drive and intelligence to follow through. He will succeed. And his success will be all of ours. Our community’s confident, positive, big vision moves significantly closer to reality today. So welcome to Austin, Dr. Johnston. We’re very, very happy to have you.